Recently, we witnessed the largest change to our tax system in over three decades with the Tax Cuts and Jobs Act (TCJA). It will take us years to fully understand all the implications of these changes but, for now, it appears there are some immediate winners—real estate investors. Before I explain why, and offer some potential strategies to consider, please remember that real estate is an important component of an individual’s overall well-diversified investment portfolio. With the recent tax bill changes, the old adage “location, location, location” has never been more true. Starting in 2018, the mortgage interest deduction will now be capped at $750,000 with interest paid on home equity or loans for vacation homes no longer deductible. Also, with State and Local Tax (SALT) deductions now capped at $10,000, these changes will have a greater impact on pricier areas and likely shift investors into hotter, lower cost markets. For individuals in high-tax states like California, New York, New Jersey, or Connecticut, the $10,000 limit may not come close to covering their combined property and income tax bills. For example, if a landlord previously had a $22,000 deduction on their real estate property holdings, they would now lose $12,000 in write-offs with the $10,000 deduction limit. How will an investor or real estate property owner respond? They can sell, decide not to buy (or expand), or increase the price of rent to recoup the loss. Since each investor will have different incentives on which of those options is best, there is the possibility for high-tax states to see rental costs move even higher. Real estate investors stand to benefit from the changes made to pass-through entities (Partnerships, Sole Proprietorship, LLCs and S corporations). The TCJA has capped the tax rate on qualified business income to 29.6%. This number is derived from the 20% deduction provided [(100% - 20%) x 37% top marginal tax bracket]. There are limitations in place for married couples with income greater than $315,000 or single individuals with income more than $157,000. Ultimately, you will need to speak to an accountant or tax advisor to sort out how you will be impacted. Rentals and real estate development should both qualify for the 20% deduction for pass-through entities. This benefit, however, has a sunset provision and is set to expire after 2025. Please also keep in mind this deduction should not apply to triple net leases. "NAHB fully supports the final conference report on tax reform legislation and commends the work of House-Senate conferees. This comprehensive overhaul of the nation's tax code will help middle-class families, maintain the nation's commitment to affordable housing and ensure that small businesses are treated fairly relative to large corporations. Lower tax rates and a fair tax code will spur economic growth and increase competitiveness, and that is good for housing. We urge the House and Senate to move quickly to pass this legislation." The differing views being expressed are certainly understandable, especially when you consider that NAR is more likely to be negatively impacted if the overall pace of home transactions decreases as a result of lost deductions. With real estate prices continuing to climb, affordability in many parts of the country is becoming an issue with experts forecasting a slower pace of transactions in 2018. Below is a chart of average price growth by state through the end of the third quarter of last year. 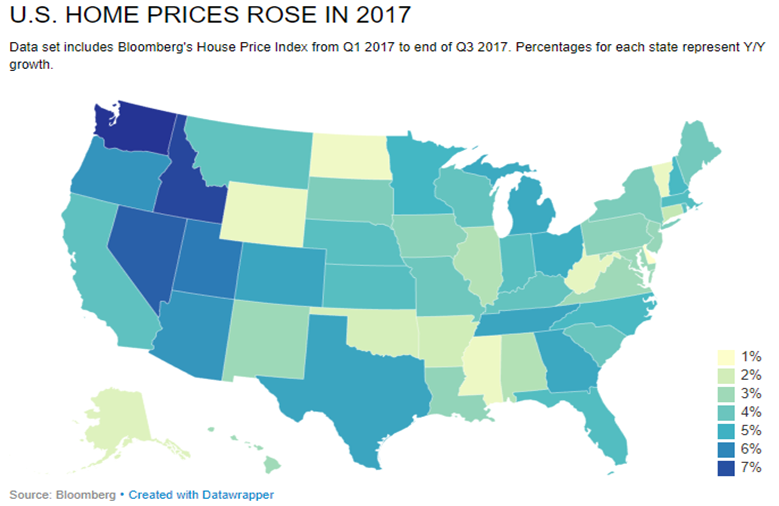 According to Zillow’s Home Value Index, in 2017 home prices rose 6.5% and are anticipated to increase 3.0% in 2018. Low inventory levels are the primary driver for price growth, leading to bidding wars in some markets. We are near the lowest levels in the last ten years for inventory and housing experts seem split on whether this trend will continue or reverse in 2018. The potential wet blanket for the housing market could be interest rates. Although there were three hikes by the Federal Reserve in 2017, mortgage rates were volatile throughout the year and seemed to be little affected by monetary policy. For 2018, expectations are for another three rate hikes, which, if accompanied by inflationary pressures, may end up being reflected in long-term borrowing costs, particularly 30-year fixed mortgage rates. This will be an important variable when it comes to the housing market and future buying demand. There are many ways that an investor can benefit from real estate investing. For current investors, the like-kind exchange of property was not impacted by the Tax Cuts and Jobs Act. This means current investors can take advantage of 1031 exchanges to find properties that will benefit from tax changes. Aside from just purchasing real estate, there are other ways to gain exposure. Real Estate Investment Trusts (REITs) are also poised to benefit from the recent tax bill. Under TCJA, normal dividends from REITs will now benefit from the 20% deduction and will no longer be taxed at ordinary income rates. This holds true for mortgage REITs as well, which could make it the preferred method for investing in mortgages since it will be the only avenue to get the 20% deduction. Given these changes and the liquidity that they can provide compared to traditional real estate, REITs can be an attractive investment vehicle for investors. Overall, it appears that at least there should be modest price growth for 2018 with potential factors that could drive price growth even higher this year, especially in lower cost markets. Understanding the impact of tax reform is paramount to an investor’s success in achieving their overall financial goals, especially in terms of the locations they choose to invest. Real estate, like other asset classes, is in a protracted bull market and it is important that an investor considers all the risks—most notably, the lack of liquidity, higher transaction costs, and potential impact from interest rate changes. Please consult a tax adviser to consider the best and most tax-efficient ways to include real estate as part of a well-diversified portfolio.